From their earliest history, the Chukchi show evidence of travelling far and wide to trade with others. In fact, there is evidence that they travelled as far east as the Yukon Territory and northern British Columbia to trade with the Athapaskan reindeer herders. (Chuckchi reindeer herders probably had more in common with the Athapaskan reindeer herders than they did Chukchi Sea Hunters. As a result of their wide trading journeys, to the west as well as the east, there is much Siberian influence in their later ornamentation � especially in the metal accents. Our 12th Chukchi earrings are inspired by an 800-year old design which showed that, by this time, the Chukchi had used much abalone shell in their jewelry. 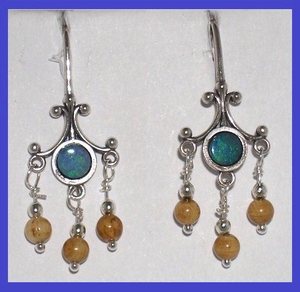 These earrings are made from Sterling Silver and have a bright blue/green opal representing the abalone shell. They are embellished with three dark, 25,000 year old Fossil Mammoth Ivory beads on Sterling Silver chain. A striking evolution of a very old design in contemporary incarnation. 1 inch high, � inch wide.